Buckley Ridges maintained its perfect start to the Dandenong District Twenty20 competition with a comprehensive victory against Narre South last Wednesday 28 November. The undefeated Bucks were rocked by a couple of early wickets in the Round 3 clash, but handy knocks by Jayson Hobbs (36) and Rajitha Jayathunga (50) saw the visitors reach 8/125 off their 20 overs. Tim Phillips was superb – particularly early – snaring 2/15, while youngster Vineth Jaysuriya Arachige (2/22) made the most of his chance and bowled brilliantly. Despite the Lions giving the game a genuine shake at times, the class of the likes of Greg Todd (4/23), Wes Nicholas (3/18) and Matthew Goodwright (2/17) ensured the Bucks got bowl the hosts out for 108. Jonty Jenner (35) and Rumesh Rangana (33) showed resistance for the Lions. North Dandenong, meanwhile, also picked up a strong win against Silverton at Lois Twohig Reserve. Off the back of Shehan Fernando (65) and gun recruit Akshay Ballal (51 not out), the Maroons managed to run down the Bakers’ 163 in just 18 overs. For the visitors, skipper Alex Kerr played a brilliant hand in the first innings, compiling a brutal 78, while Yuri Kyaboshapka chimed in with 47. Dandenong champion Brett Forsyth was also once again in the runs for Springvale South as their marquee, punching out an unbeaten 76 as the Bloods dismantled St Mary’s at Carroll Reserve. Forsyth came in at 1/41, and left the field with his side producing an imposing 3/188, with Liam Hamilton scoring 43 and Jack Sketcher 25 not out. The Bloods didn’t allow the Saints to settle at any point, suffocating the home side with a disciplined display with the ball, leaving them 8/105 at the end of their 20 overs. Young gun Sam Wetering snared 2/22 and jumped at the chance to jump up a level, while Brad Stephens (2/13) did some damage in the middle overs. The win was even more impressive due to the fact that stars Steven Spoljaric, Jarrod Armitage and Craig Slocombe didn’t suit up. Mordialloc were another side to find some form, comfortably knocking over Parkmore Pirates at Wachter Reserve. The Pirates were able to muster up 6/113 after a middle order collapse, with Helitha Withange (2/16) bowling a fine spell. Classy knocks by Ian Daniel (25) and Damith Mapa Ralage (29) saw the Bloodhounds reach the total with four wickets and eight balls left, despite the brilliance of Amal Athulathmudali (4/22) with the ball for the home side. And Beaconsfield managed to upset the highly fancied Hallam Kalora Park at Perc Allison Oval. In a low scoring affair, the Tigers managed to restrict the Hawks to 9/96, with Callan Tout (3/14), Matt Golding (2/17), Jake Cutting (2/23) and Jack Benbow (1/20) all in strong form. The Tigers took it right down to the wire, going from 6/45 to picking up the win off the very last ball of the match. Jarrod Williams (23 not out) proved to be the match winner in the lower order, showing great composure as the Hawks – led by a crucial bowling effort by Leigh Booth (3/16) – pushed hard for the win. 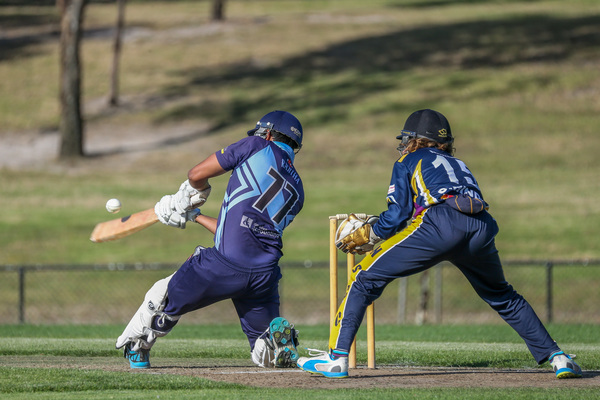 In other results across the Twenty20 round, Springvale (6/136) thumped Narre Warren (61), Lynbrook (6/125) held off Dingley (5/116) in a morale boosting win for the Lakers, Heinz Southern Districts (5/148) defeated Narre North (7/72), Doveton (5/122) defeated St Brigid’s/St Louis (9/120), Doveton North (7/125) had the better of Dandenong West (6/123), while Berwick Springs (7/152) dominated Parkfield (8/99). Berwick and Cranbourne will do battle on 12 December to complete the round. As it currently stands, the top eight is as follows: Springvale, Berwick, Springvale South, Parkmore Pirates, Beaconsfield, North Dandenong, Buckley Ridges and Berwick Springs.